From the mushy yet brilliant craniums of the Blowsion Freeride think tank, we proudly present Fistful of Foam, a Blowsion Trick Tips Odyssey. Join World Champion Pro Freeriders Ross Champion as he takes you from the very basic freshman effort of setting up your watercraft for surf carnage survival on to the extreme end of the latest and greatest aerial combination superman flips, backdoor barrels and more. 2 Disc DVD - Total Running Time- Over 2 Hours + Extras! From the mushy yet brilliant craniums of the Blowsion Freeride think tank, we proudly present Fistful of Foam, a Blowsion Trick Tips Odyssey. Join World Champion Pro Freerider Ross Champion and fellow Blowsion Air Force Team Pro Riders Randy Laine, French World Champ Pierre Maixent, German Pro Marc Sickerling, "Air" Darin Anderson, Brazilian Pro Tiago Geitens, Joe Kenney, Jerry Jones, Chris Rosner, Zack Bright, Mark Gomez and Tanner Thomas as they take you from the very basic freshman effort of setting up your watercraft for surf carnage survival on to the extreme end of the latest and greatest aerial combination superman flips, backdoor barrels and more. Never before has such a comprehensive 2 Disc DVD volume been put together for the sport of stand-up jet skiing and freeride. See how the crew at Blowsion HQ handle hull reinforcement, installing aftermarket parts, which parts are recommended for durability and superior handling, what components the pro riders would not enter the surf with, and how to evade the dreaded swooping of your girlfriend off the beach by romantic speaking French and Brazilian Pro Riders. Ross Champion and the rest of the world's top freeriders walk you through a personalized overview of what gear and safety equipment they recommend, as well as showing how you can get fit and healthy to handle the grueling conditions of freeriding. Where else can you hear the legend himself, Randy Laine, talk about his thoughts on getting barreled and catching the biggest wave ever ridden at Todos Santos? Find out how Pierre Maixent pulled the first double backflip? And how does "Air" Darin Anderson survive his incredible foam-ball aerial re-entries? Find out all of this and more in Fistful of Foam and get yourself prepped and stoked for the next riding session. This wealth of hi-definition digital surf riding sensations and knowledge is THE holy grail of the freeride experience. 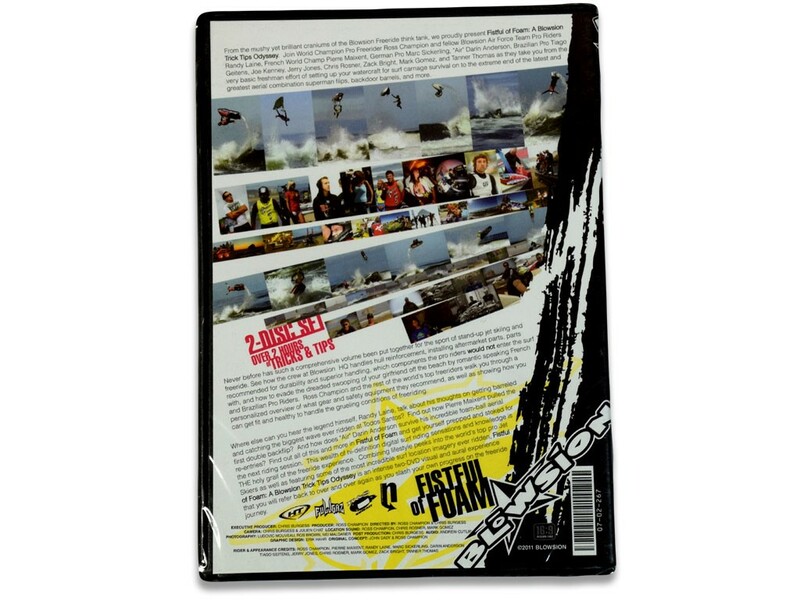 Combining lifestyle peeks into the world's top pro Jet Skiers as well as featuring some of the most incredible surf location imagery ever ridden, Fistful of Foam, a Blowsion Trick Tips Odyssey is an intense two DVD visual and aural experience that you will refer back to over and over again as you slash your own progress on the freeride journey.